This is how I feel for getting out of bed on a Monday. But I am here, with today’s Fact Of Day. Did you know that the John Carter Of Mars books inspired James Cameron when he was developing Avatar? This makes articles like this one from The Guardian rather amusing. 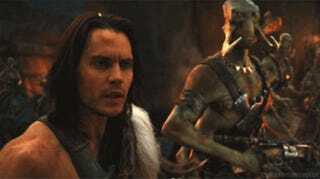 Blue brothers in arms: is John Carter just Avatar&apos;s clone? The movie was on TNT this weekend and in between chores I took a peek at it. I still say that it is not as bad a movie as it’s reputation says. In many ways it’s a much better movie than Avatar. It would be nice to see more of the novels filmed. But it doesn’t look like that will happen. Prior to the film’s release, the filmmakers reported that John Carter was intended to be the first film of a trilogy. Producers Jim Morris and Lindsey Collins began work on a sequel based on Burroughs’ second novel, The Gods of Mars. However, the film’s poor box office performance put plans for sequels on hold. In June 2012 co-writer Mark Andrews said in an interview that he, Stanton, and Chabon are still interested in doing sequels: “As soon as somebody from Disney says, ‘We want John Carter 2‍ ‘​, we’d be right there.” Despite criticism and Disney’s financial disappointment with the film, lead actors Taylor Kitsch and Willem Dafoe all showed strong support, with Kitsch stating “I would do John Carter again tomorrow. I’m very proud of John Carter”. However, in September 2012, Stanton announced that his next directorial effort would be Finding Dory, and that the plan to film a John Carter sequel “went away” and has been postponed. Kitsch later stated he will not make another John Carter film, unless Stanton returns as director. In a May 2014 interview, he added “I still talk to Lynn Collins almost daily. Those relationships that were born won’t be broken by people we never met. I miss the family. I miss Andrew Stanton. I know the second script was awesome. We had to plant a grounding, so we could really take off in the second one. The second one was even more emotionally taxing, which was awesome.” Stanton tweeted both titles and logos for the sequels that would have been made with the titles being Gods of Mars as the sequel, and Warlord of Mars as the third film. On October 20, 2014, it was confirmed that Disney had allowed the film rights to the Barsoom novels to revert to the Edgar Rice Burroughs Estate. With that, another Fact Of The Day comes to an end. I hope you all have a wonderful day and I will see you tomorrow for another Fact Of The Day. 10. Goodyear, Dana (2009-08-26). “Man of Extremes”. The New Yorker (Condé Nast). Retrieved 2014-11-26. 104. Smith, Damon (March 12, 2012). “’John Carter film review’ – start of a trilogy”. Chichester Observer. Retrieved March 13, 2012. 105. Ford, Rebecca (March 8, 2012). “’John Carter’ Producers Reveal Sequel Plans and Why They Cast Taylor Kitsch (Video)“. The Hollywood Reporter. Retrieved March 10, 2012. 106. Adam B. Vary (March 26, 2012). “Taylor Kitsch: ‘I would do ‘John Carter’ again tomorrow’”. CNN. Retrieved April 13, 2012. 107. “Director Mark Andrews Talks Replacing Brenda Chapman On ‘Brave,’ The Future Of ‘John Carter’ & More”. IndieWire. June 21, 2012. Retrieved July 6,2012. 108. “John Carter Sequel: Taylor Kitsch gives a shout out to “Best damn fans on Earth (and Mars)“”. Thejohncarterfiles.com. April 13, 2012. Retrieved July 6,2012. 109. “Willem Dafoe disappointed that John Carter sequel scrapped”. Coventry Telegraph. July 22, 2012. Retrieved August 5, 2012. 110. “Willem Dafoe still perplexed by “John Carter” reception”. ICF. June 4, 2012. Retrieved August 5, 2012. 111. “Taylor Kitsch quotes”. Brainy Quote. Retrieved July 6, 2012. 112. Keegan, Rebecca (September 8, 2012). “Director Andrew Stanton looks back on ‘John Carter’s’ rocky path”. Los Angeles Times. Retrieved September 8,2012. 113. “Taylor Kitsch Says He Won’t Do ‘John Carter 2′ Unless Andrew Stanton Directs”. slashfilm.com. Retrieved December 16, 2013. 114. Setoodah, Ramin (May 23, 2014). “Taylor Kitsch on ‘The Normal Heart’ and Wanting to Direct”. Variety. Retrieved June 9, 2014. 117. Dornbush, Jonathon (October 22, 2014). “Disney loses ‘John Carter’ rights: What’s next for the franchise?”. Entertainment Weekly. Retrieved January 5,2015.